Dungeon Masters often weave their own house rules into game play. Unlike almost every other board game, the Dungeon Master's guide actually encourages the DM to tweak, change, add, remove, bypass, or ignore any and every rule in the book they feel has a good reason to be modified. This is the genius behind D&D. It is not restricted by traditional board-game limitations. Here I've collected some of the custom house rules I usually game with. 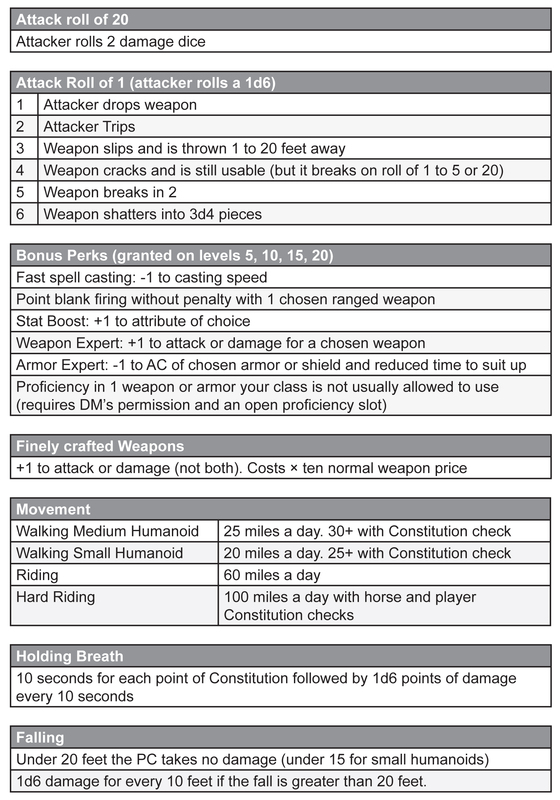 Here is my handy AD&D house rules cheat-sheet: AD&D House Rules PDF. When an attacker (character, NPC, enemy, etc...) rolls a natural attack roll of twenty (before modifiers) then they roll two damage dice. Additionally a natural attack roll of twenty will always hit its target. That means that regardless of the attacker's THAC0 and regardless of the defender's AC, the attack will ALWAYS hit! So, for example, on a perfect roll, a level 1 wizard can smite an Elder Dragon on the nose with their wimpy little first level quarter staff, a branch that they found in the forest. Now according to the math this attack would never hit the natural armor class of the dragon in a hundred years. Additionally it will have a chance to as much as double max damage! Wooo! Any damage modifiers are then added to the total of the dice rolls. My house rules is that I also extend this to creatures that can only be damaged by silver or magical weapons. In games I DM a natural roll of twenty will alway hit, even if the character's weapon can't normally damage the monster. We used to play that a natural attack roll of twenty would double the damage (for example, if you rolled an eight it would do sixteen damage), but now I play that the attacker must roll two separate damage dice. So a long sword would do two-d-eight for damage on a natural attack roll of twenty instead of just the standard one-d-eight. This is always fun (for everyone else) when it happens. With an attack roll of one the player or NPC automatically misses (regardless of THAC0 and AC) and they suffer a penalty. The attacker rolls a six sided die to determine what tragedy befalls their blunder (see table below). If they are lucky they will only drop their weapon, trip and fall, or maybe the weapons slips from their hand. If they are unlucky the weapon cracks, breaks, or shatters. Now I'm a fair DM but I also like to keep things dynamic. I play that this holds true even for magical weapons and items! Some players will cringe by hearing this but personally I think this adds a little flavor to the game. I think magic weapons should be breakable. Think of the unstoppable Paladin who wields a magic two handed sword with plus five damage. Shattering their precious sword into three-d-four pieces will give the player a new challenge that they aren't used to. This can also be a cool intro to a quest. For example when your player tries to get the weapon repaired the blacksmith could tell them that in order to re-forge their awesome magical sword they must retrieve some mystical blacksmith hammer from an ancient cursed tomb. Basically the start of another awesome quest. I play with a system of bonus perks (see the table below for specifics) and I grant these to players every 5 levels (5, 10, 15, etc...). This gives players a little more incentive to level up as well as lets them further customize their character as they reach higher and higher levels. None of the bonuses are super powerful (except maybe the Stat Boost) and yet they are really fun to add to a character that has (finally) reached level 5 (that takes some serious work). I basically stole this idea from the perk system in Fallout 3. 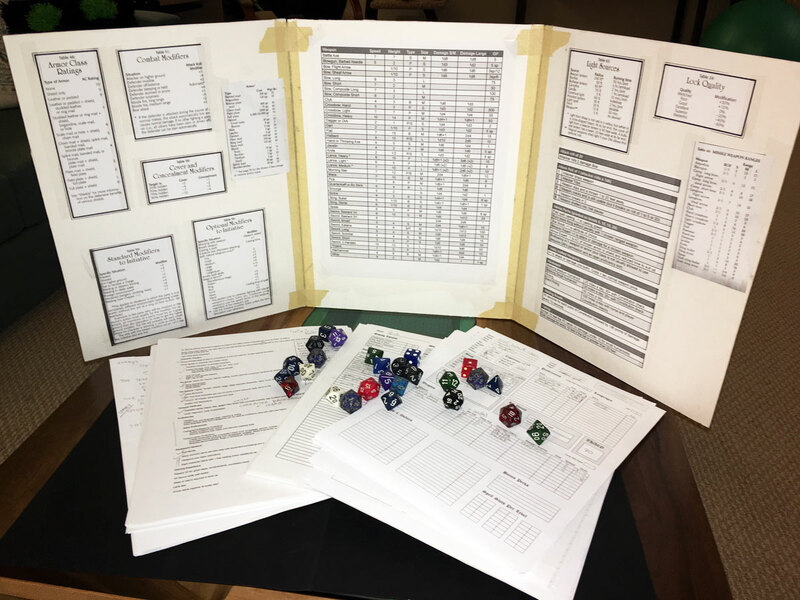 Feel free to make up more cool AD&D perks and post them in the comments! That's right. When I DM I automatically give my player's characters max hit points for their class on first level. This is a little bit of a power gamer move but overall it doesn't have a huge effect on leveling up. What it does do is make first level (which is often the most difficult) possibly just a tab bit easier. There is nothing more disappointing than rolling a one for hit points on first level! This unfortunately is the sad fate of many first level wizards. The rest of the info on this sheet is a general reference for stuff like long distance movement, holding your breath, and falling. I find that having numbers and systems for stuff like this on hand prevents halting the game to dig through the manuals or argue about stuff like how far a horse can go in a day or how much it hurts to fall twenty feet (it hurts a lot).